Get ready to buy your third copy of Avalon, and smile while doing so. As Daffy Duck once said, da-rool, da-rool. EMI has taken Roxy Music’s entire catalog – which is funny when you consider that virtually every label except for EMI had a hand in the original releases of these records, at least in the States – and given it, to use a Roxy song title, the ‘remake/remodel’ treatment and issued the whole damn thing as the 10-disc set The Complete Studio Recordings. But wait, you say, as you do the math: Roxy Music only released eight albums. What is on those last two discs? That would be the carrot, in the form of every single 7″ mix, 12″ mix, non-album single, B-side and re-recording that the band ever put to tape. The proverbial stick is that in order to get your hands on those tracks, many of which are being released on CD for the first time, you have to buy the band’s entire catalog all over again. That, and it would take an audiophile of the highest order to tell the difference between these remastered tracks and the CD reissues from a decade or so ago. Still, those two bonus CDs, while repetitive – six songs show up more than once, and both versions of any song appear back to back – contain the gold at the end of the rainbow that many Roxy fans have been searching for. And with that sweet new packaging, you better believe they’re going to pony up, especially with a sale price that averages out to a little over eight bucks per disc. The B-sides are the most fascinating stuff here. The band was already playing a different sport with their singles, but the B-sides are so left field that they’re outside the stadium and across the street from the parking lot. “Sultanesque” is the B-side to “Love is the Drug,” and it sounds like a less pristinely produced Avalon demo, a full seven years before the band released Avalon. Is that a drum machine? If so, it would have to be one of the first on a Western record not made by Kraftwerk. “The Pride and the Pain” feels like it was written to be the theme for some French romantic tragedy, while “The Numberer” showcases Brian Eno’s groundbreaking work on the keys. The band’s three 12″ mixes are here (“Dance Away,” “Angel Eyes,” and “The Main Thing”), along with the extended version of their cover of John Lennon’s “Jealous Guy”, which is only making its second appearance on CD. It’s interesting to listen to three of the edgier tracks from Manifesto (the title track, “Trash,” and “Angel Eyes”) get more refined makeovers, as it makes one look at the album versions of those songs and wonder whether it was what Bryan Ferry really wanted to do in the first place, or if he felt pressured to make at least half of Roxy’s big “comeback” album – and it really was a comeback album, as they had disbanded three years earlier – bridge the gap between their previous album, the game-changing Siren, and Manifesto‘s second side, which pointed toward the mannered cool that would become Roxy’s new “thing,” as well as the blueprint for a whole new generation of bands. Duran Duran’s “New Moon on Monday,” for one, owes its life to late-period Roxy. Coldplay’s “God Put a Smile Upon Your Face,” on the other hand, owes its life to the powerhouse Country Life track “Out of the Blue.” They may never get recognized by the Rock & Roll Hall of Fame, but there is no denying the profound influence Roxy Music had on a wide variety of bands. It’s tempting to look at a release like The Complete Studio Recordings with a cynical eye, but we prefer to take a more realistic approach; the industry got fat on back catalog sales for decades, so it makes sense that they would continue to milk that cow in their darkest hour. 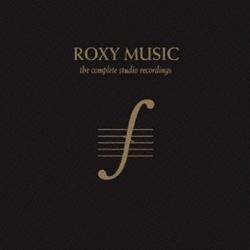 More importantly, though there are a gaggle of Roxy compilations that precede this (11, to be precise), they were all centered around the same 15 to 20 songs, and Roxy Music was, pardon the pun, more than that. This set is the proof.